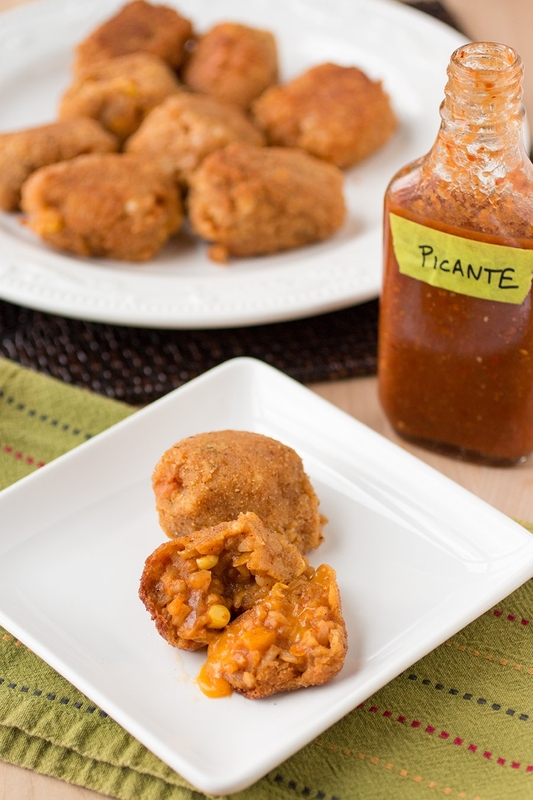 Let’s make some Italian Arancini, but with a Mexican flair using Mexican-style risotto, stuffing them with cheddar cheese, and serving them with a nice picante sauce. It’s a fun mashup recipe. The first time I encountered Arancini was in a local chain Italian restaurant. We sat down for a lunch and the server brought over the specials, and on the appetizer list was something called “Arancini”. I had never had it so didn’t know exactly what it was. Nowadays, with smart phones and Google at our fingertips, it didn’t take long for me know I had to try them. I found myself surprised that a chain restaurant would serve something so cool, but in reality, this fancy sounding appetizer is not much more than breaded and deep fried balls of rice that have been stuffed with cheese or meats. Or both. You know what I have to say to that? YUM. #GiveMeSomeArancini. In face, Wikipedia tell me that “Arancini ([aranˈtʃiːni]; Italian: arancino, Sicilian: arancini or arancine) are stuffed rice balls, coated with breadcrumbs, which are fried. They are usually filled with ragù (meat and tomato sauce), mozzarella, and peas. There are a number of regional variants that differ in fillings and shape. The name derives from their shape and color, which is reminiscent of an orange (the Italian word for orange is arancia, and arancina means “little orange”). 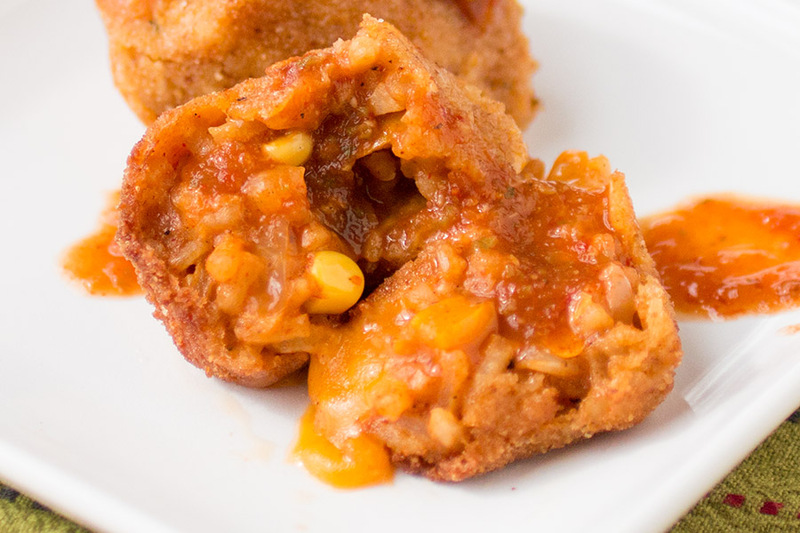 In eastern Sicily (especially in Catania), however, arancini have a more conical shape.” See for yourself. Of course, being Chili Pepper Madness, we had to make our own version using ingredients that are more traditionally Mexican. Why? No reason! Just because! We LOVE Italian food as much as anyone else, but for some reason I was in the mood to incorporate my newly acquired ancho powder into something, so here we are. I’ve included a risotto recipe for you here to use, but this is also a useful recipe for leftover risotto. I’ve actually made Mexican-Style Arancini out of a Sweet Corn Risotto and from leftover Mexican Rice, and honestly, it works best with a starchy rice like Arborio or even sushi rice. You want the rice to be nice and sticky-gooey on the inside. These broke apart nicely and were very sauce within, not dry, as I’ve seen some come out. 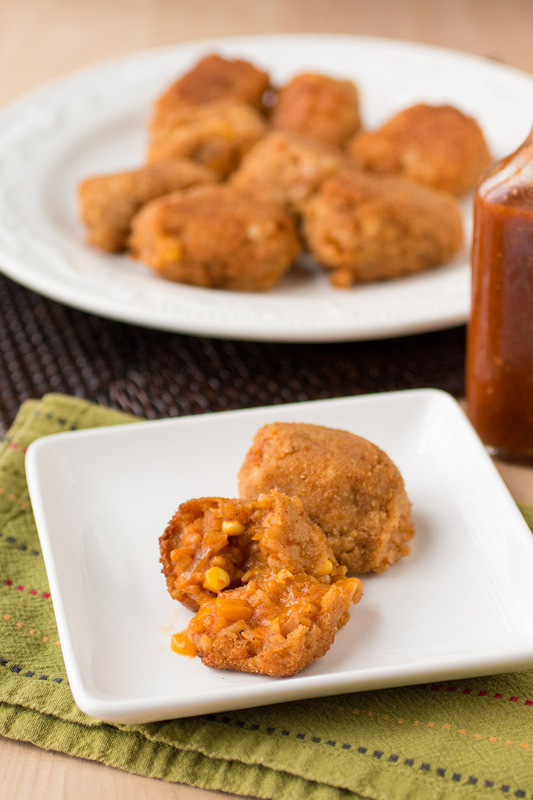 Serve these up with a nice picante sauce or with a simple chipotle crema and you’re good to go! Picante sauce for serving – or maybe a good chipotle crema! Add the chicken stock to a pot and heat it gently on the stove. Keep it low and warm. Heat a separate large pot over medium heat and add olive oil. Heat through. Add onion, peppers and corn. Cook about 5 minutes to soften, and until the corn just starts to turn golden. Add garlic and cook another minute, stirring, until fragrant. Add rice and stir to coat the rice with the moisture. Add the wine and allow the rice to absorb the liquid, stirring often, about 5 minutes or so. Add the chicken stock a half cup at a time, stirring often, until it is absorbed into the rice. The entire process can take 20 minutes or so, depending on how al dente you like your rice. Stir in the ancho powder, cumin and paprika about half way through the stock process, allowing the seasoning to incorporate. Remove from heat and stir in the Parmesan cheese. Set aside to cool. Next, set out three bowls in a row. Set the flour in the first, the egg (beaten) in the second, and the bread crumbs in the third. Pour the oil into a large pan and bring to a medium heat, but do not allow it to smoke. Form the rice into small balls that fit into the palm of your hand and stuff a cube of cheese into the center. Form the rice around it. You should wind up with 40-ish balls this way. Or make them larger if you’d like! Dip each rice ball first in flour, then in the egg, then in bread crumbs. Fry them in small batches, 5-6 at a time, about 3-4 minutes per side, or until they brown nicely. Set them onto serving plates and serve with Picante sauce or chipotle crema.